Anyway, for those visitors deciding whether to bother with the leg stretch (it’s about 2 miles or so), I hope this post might tempt you as it really is an excellent walk with some scenery worthy of that overused word, ‘stunning’. The way-marked walks here generally start at the playpark opposite the steading arch, where there is a big signboard giving you a bit of information before you leave. 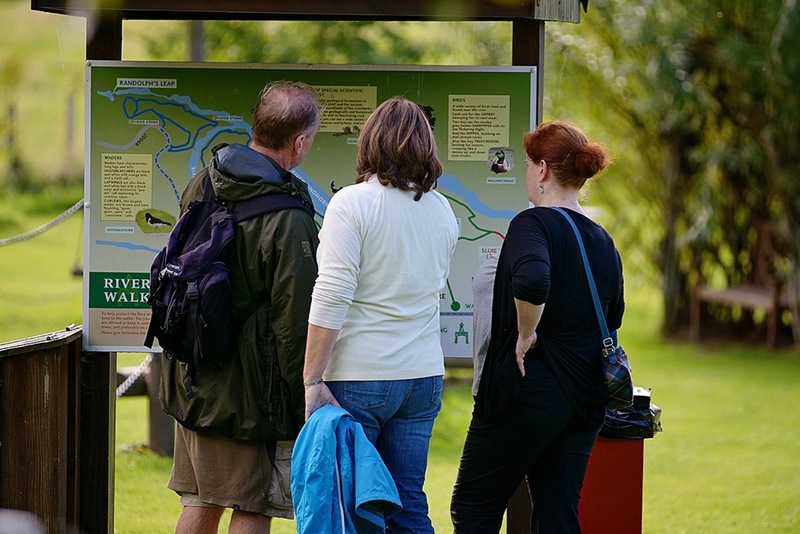 There are also paper maps you can pick up in the gallery or bookshop for a small donation to the River Trust if you like to have something to carry with you. There are markers along the way to keep you right too. 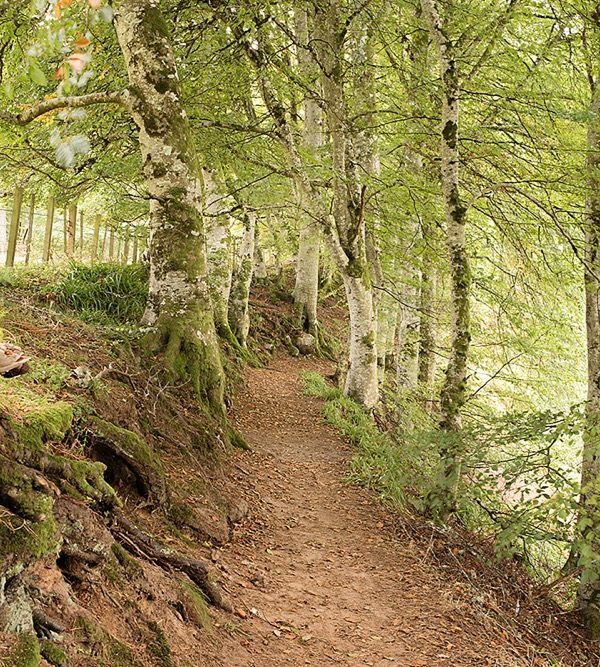 Arguably the best route is to head on through the playpark, bearing left at the end of the grassy walk and following the crest of the hill with the trees to your right and glimpses of the river flashing between them below. 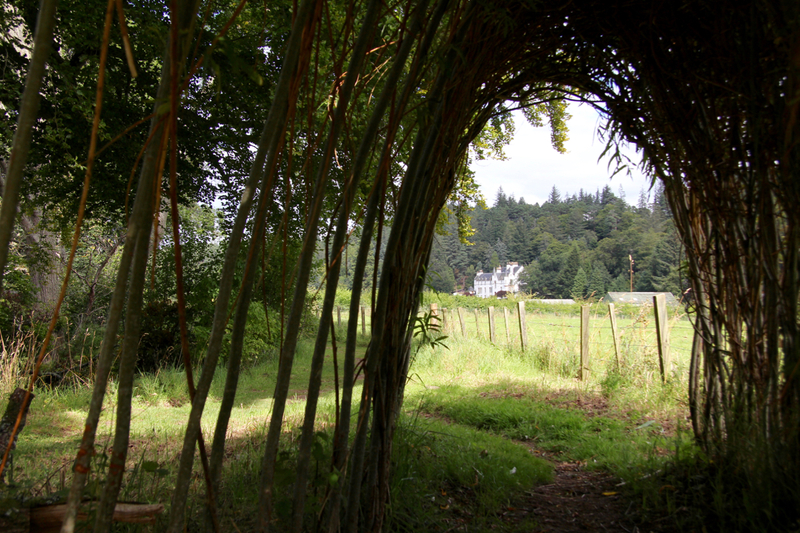 You will soon come to the willow arch – it’s worth taking a look back through it at Logie Steading and Logie House behind you. Shortly after this you bear right down the hill to the river. If you keep right you’ll find yourself at the highpoint, the Lookout, where you can survey the river from on high in both directions. It’s a pretty dramatic spot. And a perfect place for a little dog to pose. If you were to turn right/downstream from here you would head towards Sluie and a whole other set of walks. But this time we’re headed to Randolph’s Leap so it’s a left turn to follow the river upstream. 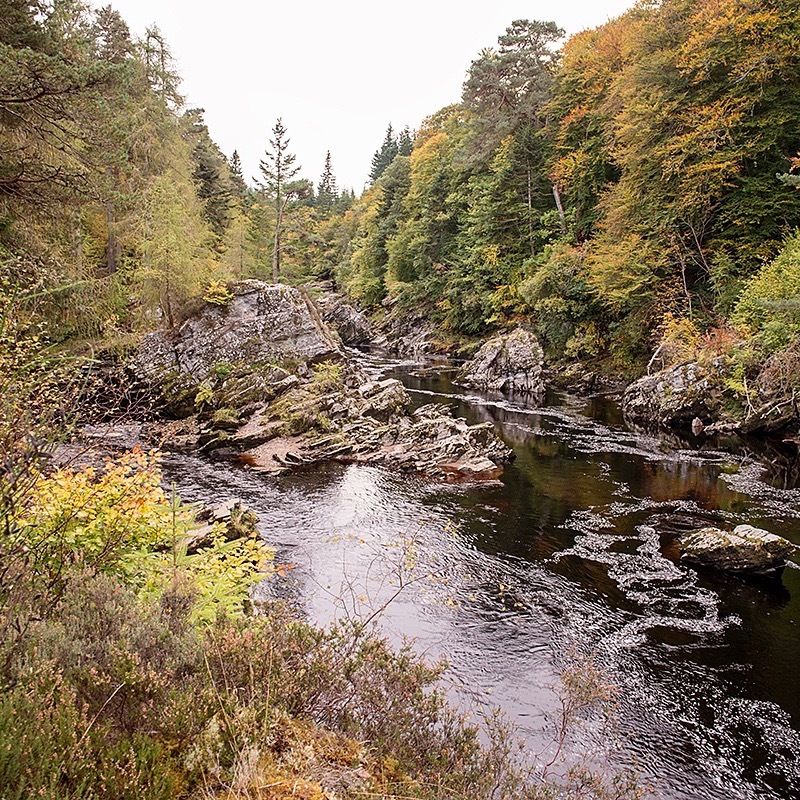 After a little way you can turn back to Logie Steading if you just wanted a short potter to see the river, but if you’d like to make the most of it keep straight on signed to Randolph’s Leap. Next up is one of my favourite spots – the Junction. 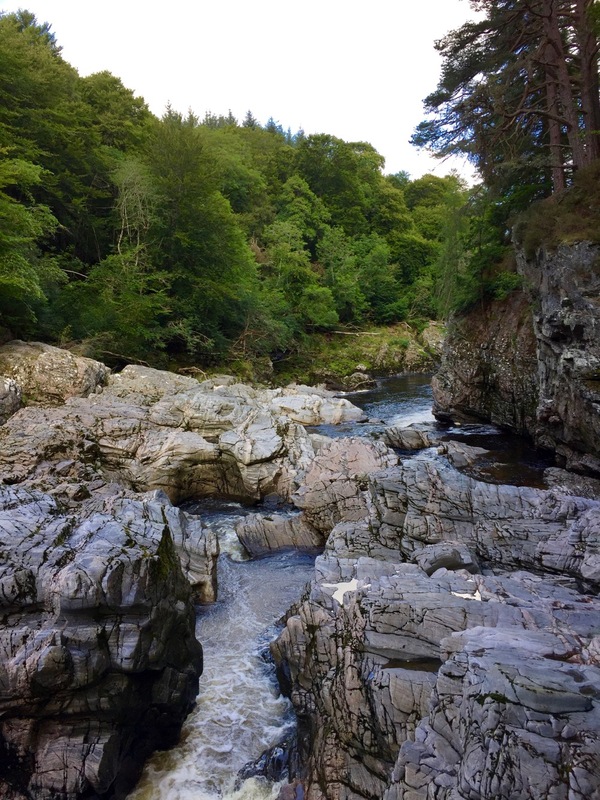 The larger river (on the right hand side of the photograph below) is the River Findhorn, and the river (on the left of the picture) that you are now about to follow upstream is the River Divie. This is where the two meet and the Findhorn changes quite dramatically in size. The field on your left as you head upstream along the Divie is home to a group of the Logie Longhorns at various times of year. They’re often very happy to pose for a picture! Continue along the path until you come out onto the road with the bridge over the River Divie to your right. Head over the bridge and on your right you’ll see a lay-by and a path downhill to your right towards the river (when you came over the bridge you put yourself between the two rivers and are now back looking at the River Findhorn). Follow this until you reach the signboard near the road’s edge which will direct you on the short walk from here to Randolph’s Leap. Here you will see the river below you is forced through a narrow gap where, hundreds of years ago, a local man lept across from the other (lower side). Quite a feat but one that probably seems more achievable when you’re being chased by a bunch of angry pike-wielders. 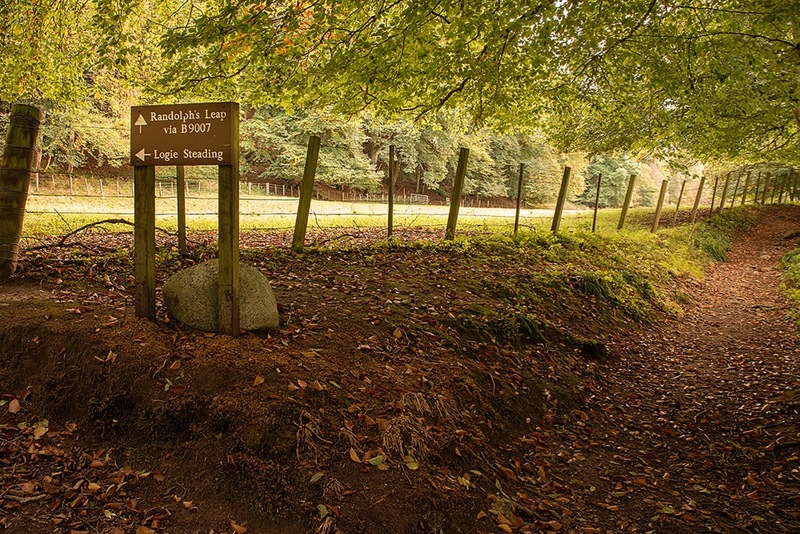 Something of this tale can be read on the sign boards nearby, and a great deal more of the local (often quite bloody) history can be found out at the Heritage Centre back at Logie Steading. 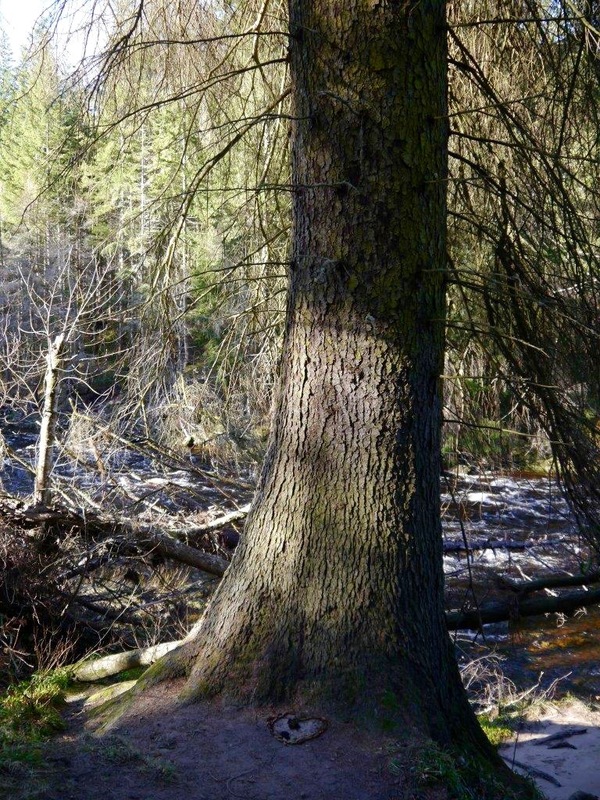 The Moray Floods and the Second Tallest Tree in Scotland! Once you’ve had your fill of the dramatic scenes at Randolph’s Leap, if you head back towards the road (bearing slightly right of the way you arrived) you’ll see a little stone in a cage with some writing (almost obscured) carved into it. This is the point where the river waters reached in the floods of 1829. When you look back to the river from here (which you can’t actually see, in general, as it’s down in the gorge), the thought of that volume of water passing by your feet is quite terrifying. The noise alone must have been fearsome. If you continue upstream a little way from here, you’ll see a small clearing down to your right and (the base of) an enormous tree. We’re told it’s the second tallest tree in Scotland! How do they know that?! 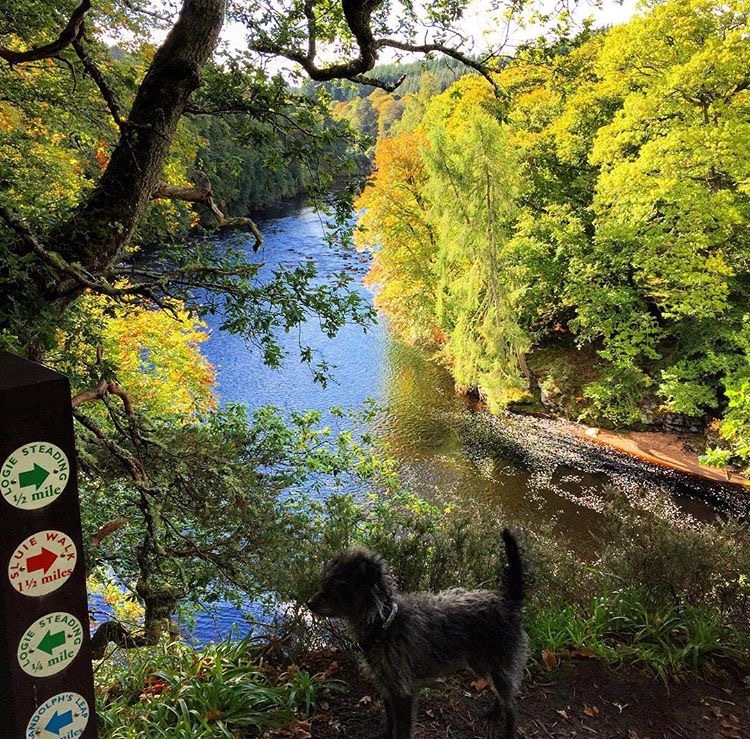 From here you can choose to extend your walk up the Findhorn to Daltullich Bridge, or turn back across the Dive Bridge and head for ‘home’. Once you’re over the Divie Bridge, head back along the path to your left a short way. 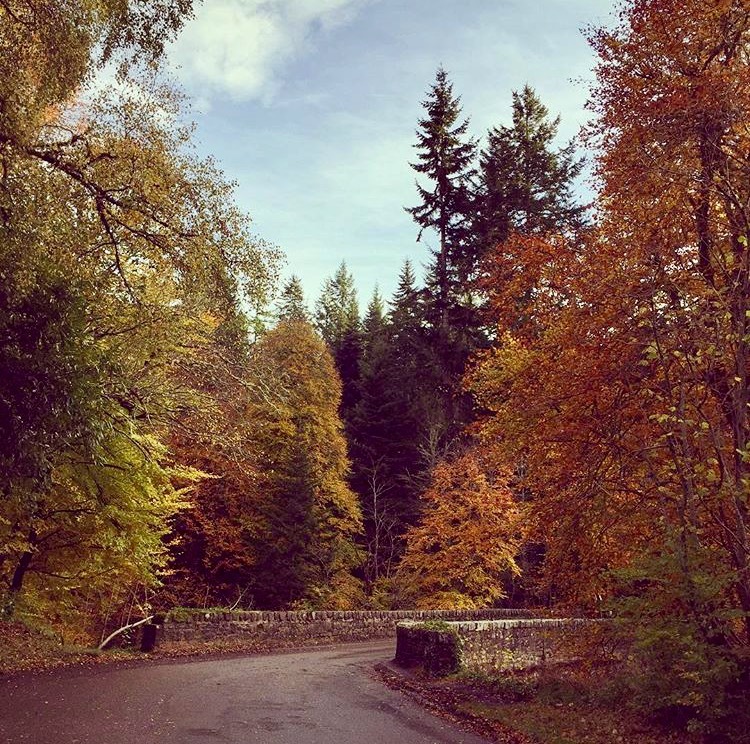 You’ll come to a fork and can either go left, back the way you came, or right following the road a short way then cutting up (slightly left) through the trees and along the field back to the drive to Logie Steading. The tree lined and level drive is a pleasant, easy way to finish your walk. Well, that and perhaps a cake and a cuppa at The Olive Tree. As you might have noticed, the selection of pictures were taken over many different times along this walk, in various seasons (mostly taken by me on my phone, one or two by Gary Murison – you’ll be able to tell which are which!). Rather than giving a picture of the walk just at one time of year, I thought a variety might be give an idea of the varied scene as you walk the same walk at different points in the year. 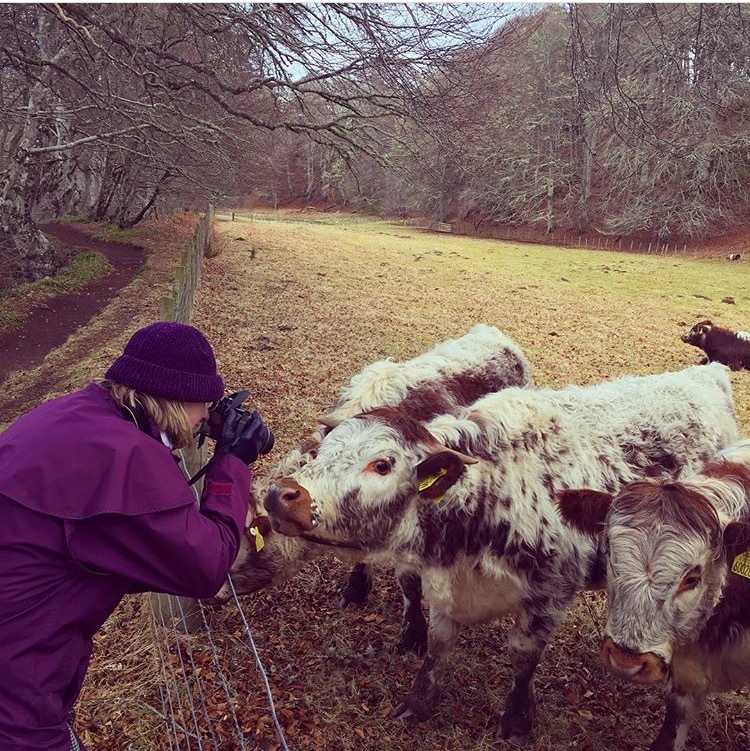 In spring leaves are just starting to appear, days are longer and brighter and you’ll hear birds in the trees and may even see a Longhorn calf or two along the route. By summer the leaves on the trees are at their full opulence and it’s green and growth and colour everywhere. Autumn (possibly my favourite time to walk at Logie) brings a riot of brassy bronzes, yellows, ambers and reds both up above and under foot. In winter the deciduous trees are bare but you might find the drama of the river frozen right across, great icicles hanging from rocks or tree stumps along the path, or even a picturesque dusting of snow. *I thought I should add that while this walk is not particularly long, and is particularly scenic, it is not suitable for wheels or for the infirm. There are steep, uneven paths and the edge of the river is unfenced. Please keep a close eye on children by the river. 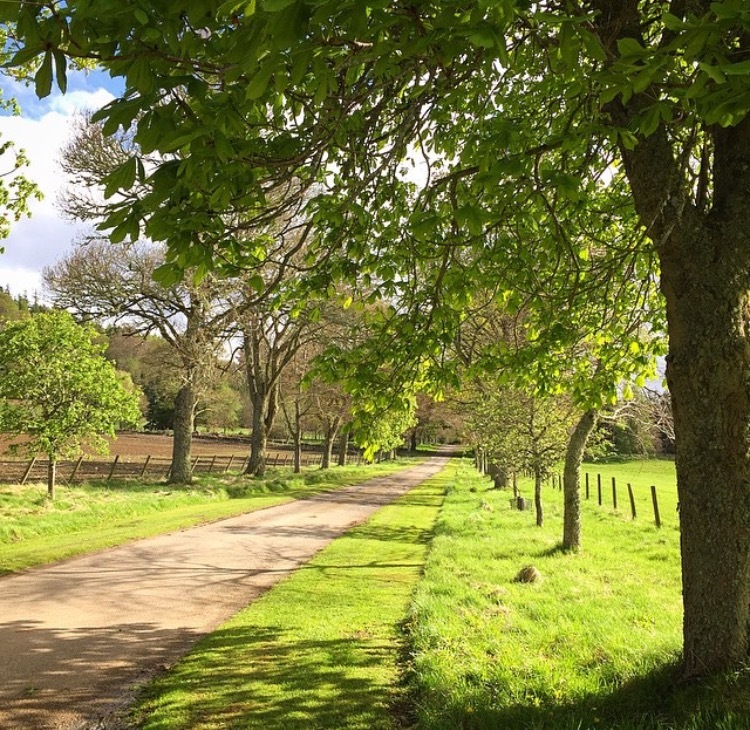 A short, more even-underfoot walk can be had either along the drive to the steading, or from the steading to and around Logie House Garden. Both of these are possible with a wheel or push chair.